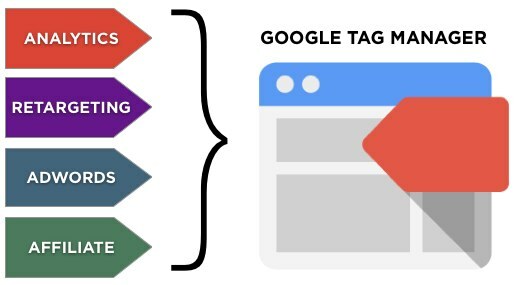 A while back Google launched its own “tag management solution.” For those of you who have not heard of it, here is a summation post about the basics. Briefly, it is a web interface where you can manage different types of tags – small code snippets makes it possible to e.g. measure / collect information on what is happening on a website – you want to place on their website. What you do is that on their website puts a code, the “container”, which then ensures that load other scripts or tags that you want to load. Instead of each code to be inserted into the page, you can add them inside the interface of Google Tag Manager. Using the settings in the Web interface, you can then use rules to control the pages where specific tags be loaded. When a page is visited, Google Tag Manager to load the tags that should be loaded right there. Google Tag Manager also charges these scripts asynchronously, which is preferable if you have many tags and do not want it to affect the load time too much. When developers at a company has implemented the Google Tag Manager is very easy to update or add new tags. It makes it easy for example, the marketing department to act quickly to implement tags to start tracking event in Google Analytics. To make it even easier, there are a lot of finished tags where you need to fill only a few values; example is Google Analytics, Google AdWords Conversion Pixel and AdWords Remarketing Pixel. One tip is to parallel install Universal Analytics in Google Tag Manager. This is advantageous when the Universal Analytics, which is now in public beta, continuously updated, and these updates will be done painlessly by Google Tag Manager. It is not, however, not always to the technical competence alone is sufficient. You, who works with Google Analytics and website are usually marketed people with high skills in strategy, marketing and their own industry. In addition, there’ll be an IT department, a technically competent employee or a web agency. Somewhere on the border between these compartments lands task of implementing eg Google Analytics code, remarketing snippets or Event Tracking. Since Google Tag Manager launched the product has evolved rapidly, and there are excellent opportunities to create customized solutions that can be rapidly adapt. We have implemented Google Tag Manager with a number of clients where the marketing department – on your own, or with help – then have been able to go in and set up tracking of targets, keystrokes or other features of the page.